zone, turbidite basin, and metamorphic. (2) We make correlations between terranes. (3) We group coeval terranes into a single tectonic origin, for example, a single island arc or subduction zone. 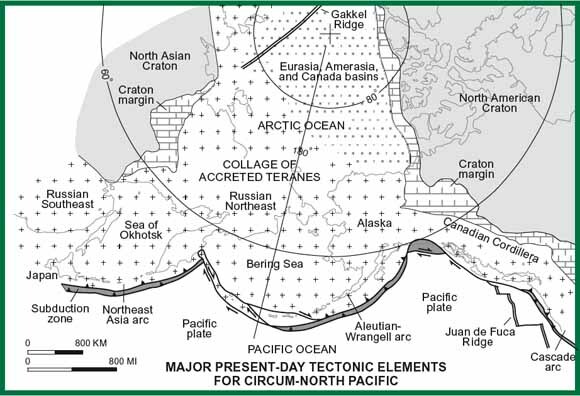 (4) We group igneous-arc and subduction- zone terranes, which are interpreted as being tectonically linked, into coeval, curvilinear arc/subduction-zone complexes. (5) We interpret the original positions of terranes, using geologic, faunal, and paleomagnetic data. (6) We construct the paths of tectonic migration.